You meet a guy (or girl, depending upon your gender preference) who is perfect in every way (yes, this is a trite beginning, but let's assume he/she is perfect without being too perfect). He/she (known as "he" from here on out for simplification of syntax) has all the qualities you've been looking for in a companion. Also, he's extremely pleasant to the eye. BUT (you knew this was coming), there is one exception to this guy's otherwise perfect existence: every night at 12:00 a.m. he watches a Care Bear movie for an hr. and fifteen-minute duration. Before each nightly viewing he spreads all of his Care Bear memorabilia (a.k.a. crap), including pillows, stuffed animals, limited edition tupperware circa 1985, etc. onto the sofa. Usually he wears a too-small Care Bears t-shirt (a children's size 6x that he calls "a thrift sale gem") and his Sunshine Bear sweatband. However, he occasionally wears his polyfill Care Bear suit with the lazy eye, which is quite unnerving (it was left over from the short-lived "Care Bears on Ice"). He generally doesn't make you watch with him, but sometimes you awake to his high pitched squeals of excitement (usually in response to the rescue scene). Also (and here's the real kicker), every morning he tries to explain the movie to you as if you'd never seen it. His excitement never lessens. 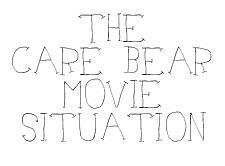 He even tries to submit his reviews of the Care Bear movie to major newspapers (such as the Washington Post, the Wall Street Journal, the London Times - which actually was considering publishing it for a while). Occasionally he makes comments like, "I think Thunder Bear has an inferiority complex, which would explain his gruffness towards the other bears," or "The uplifting ending really compliments the depth and emotion portrayed by the actors," (in response to which you sometimes shout "What f@$#ing actors!?" but by that time he's ordinarily too far gone to pay much attention to your outcry). Anyway, the question is obviously: can you live with a habit that odd if this person is otherwise perfect for you? The Care Bear images on this page were ripped off from a Care Bear Site.